It’s Friday – time to share some frugal finds with you! I stopped last Friday at a quick yard sale on my way to town. I spent a whopping three quarters! 25¢ for the frame and 50¢ for the container. I loved the mason jar type canister (especially for 50¢). We had just been talking on facebook earlier that day about a large Ball jar I had seen at Hobby Lobby that would make a good canister. So I was excited to pick this one up for 50¢. Now to decide what to store in it! I had missed the last 2 Saturdays at my parking lot yard sale due to rain so I was looking forward to shopping again. And it didn’t disappoint. I stopped at the space that sells things for charity. They sell most things for 25¢. I immediately spotted this white vintage suitcase! I asked what they wanted for it and they said they were having a “pack a bag for a $1.00” sale, so I could pack a suitcase for a $1.00. SOLD! I found a few other small things to stash inside. A old book of Psalms beautifully illustrated, a glasses case, and 2 mason spice/salt/pepper jars. So I paid about 20¢ each – great deal! And I managed to find a few books at another space. Lots of Bible story books for my nieces – 25¢ each. $2.75 for all of these. So there was my big spending of the week! I spent $4.50 and came home with a bunch of small treasures. Yes, I love yard sale shopping! I am planning another yard sale/thrift shopping day for anyone that wants to come in September. So stay tuned for that announcement! Did you find anything fun this week? I love to see what others find too so share it in the comments! 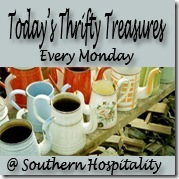 Great finds….love that vintage suitcase! I went to Hobby Lobby last weekend after our Facebook chat about the Mason jars. Picked up 3 jars for right over $1 each as they were 50% off. Promptly filled one with crepe myrtle cut from our trees for a centerpiece at our family get together that evening….lovely! I need to pick up some glass paint and try my hand at painting one or two of them blue. sounds pretty! 🙂 let me know if you do the paint and how it turns out. Wait! You mean I’m cool?! I have canisters like that and I was going to get rid of them! Now I see that the home decor blogger likes them! Seriously, they just don’t really look right with the rest of my kitchen. I hope you have some ideas on what to use them for besides just storing flour or whatever because I may not get rid of mine now! LOL! 🙂 I am not sure what I am going to do with them. I might use them to store flour or even granola. Or I might use them to store craft supplies too. It is just expensive to buy glass canisters like those so when I can find them for a steal, I pick them up. And they resemble mason jars and I am in love with mason jars right now 🙂 you could probably spray paint the outside (so it would be food safe) if you wanted them to be a color. I don’t know what I am going to do with the suitcase yet, I just couldn’t pass it up for less than $1.00. Dress up clothes would be fun or even craft supplies or something. We’ll see. Would you do anything to do the brassey handles? I am thinking maybe some rub n buff? Yesterday I bought a Country Cottage File Cabinet at amazon. You will be impressed by the simple beauty and utility of this piece. Christine, you found some awesome finds. I especially like that suitcase. I’ve been looking for a similar one to paint. And I have a few jars like the one you found. I use them in the pantry to store things. I am not sure if I will do anything to the suitcase or not. Need to clean it up a bit and then decide. That is what I am thinking I will do with the jars too. I would love have one of those “pretty pantries” one day where things are organized in glass jars, etc. So I just keep picking them up when I see them. Also could be good for organizing sewing and crafting supplies. I’m sure you know that suitcase decorating is very hot right now. They are great to stack, even in different colors and used as end tables. My friend used hers and topped with larger piece of glass or a great coffee table and she is a designer. They were old, vintage. My daughter decopauged hers and it is beautiful! I love the vintage suitcase! I picked one up recently at a thrift store for $5, now I feel robbed, lol 😉 Visiting from Southern Hospitality! An idea for the suitcase. Can’t find the first suitcase table I saw. It was decoupaged on the inside with old book pages. That one didn’t have screw-on legs, like this. My husband has an old wooden leather covered box that is going to be a night stand. I may just attach it to an existing table that is too low, or may put legs on it. Still thinking on it. There’s the saddle soap to clean it up first… Always something, ya know? I love your site! Thanks! But I’ve never seen a Value Village in GA, on AK. We have Savers up here in New England.